Tire ratings were developed by the National Highway Traffic Safety Administration (part of the Department of Transportation) purposes of safety, fuel economy, measuring tire durability, and developing tire speed ratings. Use our tire rating guide below and be informed when choosing your next set of car tires. 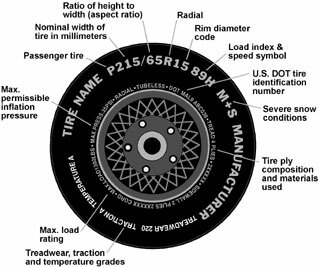 It is required by federal law that tire manufacturers label the sidewall of all car tires with standard information. 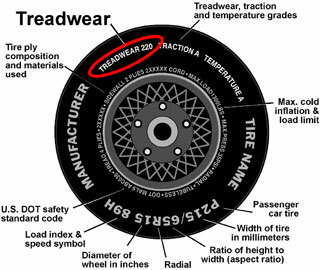 This describes the basic characteristics of the tire and also provides a tire ID number in case of a recall. The "P" stands for "Passenger Vehicle"
"215" is the nominal width of the tire. This nominal width is measured in millimeters. Basically, the larger this number is, the wider the tire is. The "65" in the above image is tires Aspect Ratio. This is the height 'to' width ratio. A number of 70 or lower means the sidewall is shorter. This gives better steering response and is said to be a better overall tire in dry weather. "R" means the tire has radial ply construction. This is an industry standard and has been for over 20 years. "15" refers to the 'Rim Diameter Code' and is measured in inches. Be sure to note this if you buy new wheels. "89" refers to the load index. This may not be on all tires as it's a rating that is not required by law. The load index is a measurement of how much weight can be supported by each tire. If this is something of interest to you then you should look it up in the owner's manual, or talk to your tire dealer. "M+S" (sometimes seen as M/S) refers to 'Mud and show'. 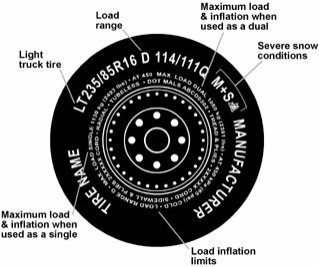 Most radial tires have some mud and snow capabilities so these markings will often be listed. * If a tires maximum speed is over 149 mph, the tire manufacturer may use the letters ZR. If the maximum speed is over 186 then ZR is always used. The "LT" stands for Light Truck Tires. The "D" is for the load range and you would need to talk to your tire dealer for specifics on that tire. The inner circle also shows a Max. Load Duel and a Max Load Single. Both of these tire ratings are for when the tire is cold. Duel is for when four tires are put on each rear axle (that is... six tires total on the vehicle). 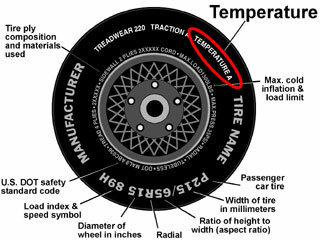 The temperature grades indicate what the tire's resistance to heat is. This is an important rating if you typically drive long stretches in hot weather. The resistance ratings are 'A', 'B', and 'C'. Note that 27% are rated 'A', 59% are rated 'B', and 11% are rated 'C'. Tire traction ratings indicate how well the tire can stop on wet pavement. The higher the rating the shorter the distance the car is able to stop on wet roads. The rating system for traction is highest to lowest (AA, A, B, and C). Only one percent of tires manufactured today earn a C rating, while only 3% of tires are rated AA. A majority of tires (75%) have an 'A' rating. This rating measures the relative rate of wear for the tire. The higher the rating the better the tire is in regards to wear. This rating is relative in how the tires are tested. A 'control tire' is used in tests and given a rate of 100. Subsequent tires are tested and rated higher or lower than the control tire. A tire rated at 200 should last twice as long as a one rated at 100. 2% of tires today are rated at over 600. On average tires are rated between 300 and 500. What do people think about Goodyear Tires? More Tire Reviews Coming Every Week!! To keep in the loop on what the best, sign up for our monthly tire-review-newsletter. You'll get bite-sized chunks of information and tire reviews on the hottest tires, best values, and big tire manufacturer news (such as recalls). I promise to use it only to send you Monthy Tire-Review-Newsletter. Copyright © 2010. Tire-Reviews-Online.com All rights reserved.